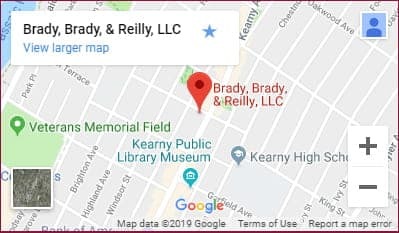 The law firm of Brady, Brady & Reilly (BBR) has been serving people in New Jersey since 1965. During that time, our attorneys have acquired a reputation for achie ving results at trial. Our knowledge of the law and our tenacity in the courtroom have provided our clients with favorable outcomes in even the most complex cases. Our primary focus is helping victims of serious injury and their families recover maximum compensation for their losses. Our attorneys are prepared to assist you with every aspect of your case or claim. We will guide you through the process, whatever the nature of your claim. You will meet with our attorneys who will work with you throughout your case to get you the best compensation available both in civil courts and workers compensation courts. We offer the service and counsel of leading trial attorneys who appear in court regularly on behalf of clients who are seeking compensation for their injuries. Kathleen M. Reilly has been certified by the Supreme Court of New Jersey as a Civil Trial Lawyer. She is known for her success in the courtroom. Skilled in negotiation, she and her associates are prepared to take any case to trial to achieve a desired outcome. For the convenience of our clients, we offer evening appointments. We welcome Spanish and Portuguese speakers and can arrange for translators of other languages as needed. For personal injury matters, we provide free initial consultations and take cases on a contingency basis so that you pay nothing until we recover compensation for you. Free consultations · Evening, hospital and in-house visits · Spanish and Portuguese language services available · Se habla español · Call (201) 997-0030 or contact us by e-mail to arrange a case evaluation directly with a North Arlington auto injury lawyer.